In Friend & Foe, researchers Galinsky and Schweitzer explain why this debate misses the mark. Rather than being hardwired to compete or cooperate, we have evolved to do both. In every relationship, from co-workers to friends to spouses to siblings we are both friends and foes. It is only by learning how to strike the right balance between these two forces that we can improve our long-term relationships and get more of what we want. For some people, the key to success is competition — always looking after their self-interest and fighting to be better than others. Others believe that success comes to those who are best at cooperation — who know how to collaborate with others. Columbia Business School professor Adam Galinsky and Wharton professor Maurice Schweitzer argue that this dichotomy is false. 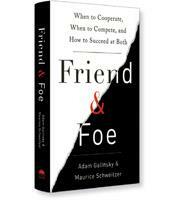 In their new book, Friend & Foe: When to Cooperate, When to Compete and How to Succeed at Both, Galinsky and Schweitzer build on research from across the social sciences as well as advances in neuroscience to explain how the most successful people and successful relationships are those in which we find the right balance of both competition and cooperation. We are always toggling between the two, although it is not easy. According to the authors, three fundamental forces — resources are scarce, humans are social beings and the social world is unstable and dynamic — give rise to an ongoing tension between competition and cooperation. These three fundamental forces are the underlying threads that run throughout the book. 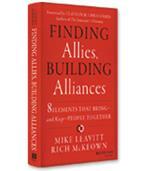 A chapter that explores the role that social comparisons play in our lives illustrates how these forces impact cooperation and competition. We are social beings, the authors write, and one way we figure our place in our dynamic world is by comparing ourselves with others. Such social comparisons can be motivating. When the Soviets became the first country to fly a man in orbit, the United States felt it must do better; the result was the successful first mission to the moon. Social comparisons, however, can also be destructive, as the attack of Olympic skater Tonya Harding on rival Nancy Kerrigan demonstrates. Social comparisons help put our achievements in context, notably when scarce resources are involved. The authors cite one academic study that showed that people who graduate during a recession are happier with their first jobs than people who get their first jobs during an economic expansion. The reason? During an economic downturn, graduates who get a job compare themselves to most other graduates, who aren’t able to get a job at all. The authors offer three principles that help harness the power of social comparisons and make them work for us rather than bring us down. The first is to recognize the natural order of things in which most of us instinctively believe. One example of this natural order is that older siblings should be successful first. The Williams sisters (and in another domain, John Kennedy and Robert Kennedy) worked well together, as the older sibling was the first to reach the heights of their profession. The second principle is to recognize or create new opportunities to compete. Turn disappointment into motivation to do better next time. The third principle is to allow others to have some schadenfreude — some joy in someone’s misery. After your incredible vacation to Fiji, the authors suggest, don’t forget to focus on the negatives as well (the rainy days, the lost luggage). The core lesson of social comparisons, write the authors, is to seek favorable comparisons to make yourself happy, unfavorable comparisons to push yourself harder. The chapter on social comparisons is the opening salvo of a fascinating exploration into how humans both collaborate and compete and how it’s possible to find that perfect balance between the two. The authors cover a surprisingly wide range of issues, such as the role of “psychological safety” (the permission to speak up), that enable hierarchies to be productive rather than destructive; how to use both competence and warmth to build trust; and how women can compete without facing the unfair gender-stereotypical backlash of being too “hard” or “tough” — to name just three examples. Filled with unforgettable stories, this is the ultimate guide for learning when to cooperate as a friend and when to compete as a foe.